The Simon Munir-owned mare took Henderson’s tally this week to five and his overall record at the meeting to 44 victories. The four-timer paid a sparkling 3,381.5/1. Victory in this race was especially sweet for the Lambourn-based Henderson, for it commemorates the great jockey and trainer Fred Winter, to whom Henderson was an assistant before branching out on his own. In the winner’s enclosure, Henderson revealed that he was wearing a suit owned by his late father Johnny. He had suspected today would be a good one for the yard, so wore the suit as a mark of respect for a man who he said “had been instrumental in the success of Cheltenham”. Johnny Henderson, who died in 2005, helped save Cheltenham Racecourse when a member of the Jockey Club in 1963. Together with other members of the Jockey Club, he raised £240,000 to purchase the course and established Racecourse Holdings Trust to run it. RHT, now Jockey Club Racecourses, has 14 racecourses today. Nicky Henderson said: “It’s been one of those days - we’ll probably wake up and find it’s been a good dream. We’ve had a lot of great days, but Cheltenham comes round once a year and to everyone here it’s the best four days of the year. It doesn’t get any better and it’s lovely to win the Fred Winter, who was friend, boss, mentor and tutor. Simon Munir had suffered disappointment when his Grandouet was ruled out of the Festival four weeks ago through injury, but this win was some consolation. He said: “Racing is a great leveller. We were in two minds about running this mare because she was quite disappointing when she ran in the Adonis Hurdle [at Kempton]. We decided to give her a chance and look what happened. 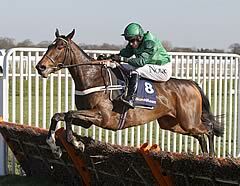 Jeremiah McGrath rode Une Artiste to victory up Cheltenham’s famous hill and added yet another win to the remarkable haul of Nicky Henderson’s Seven Barrows stable which celebrated its fifth win of the 2012 Festival and fourth of the day. The delighted 21-year-old conditional jockey said: “That was my first Festival winner and the last day I was here at Cheltenham was back in December when I took a really bad fall on my birthday. This has definitely made up for it. It’s unbelievable. “I’d like to thank [owner] Mr Munir and Mr Henderson. We’ve had a fantastic day. There’s an awful lot of work that goes on behind the scenes and it’s paid off for everybody back at the yard. It’s absolutely brilliant. “He’s still a baby, still learning. I don’t think he’s ever been crowded in a pack like that and you could see him just looking a bit timid for a stride or too, although he finished the race off well. Ideally, I probably would have liked to give him another race after Newbury, just to get the experience into him, but the handicapper would have had a say. Class 1, Grade 3, £60,000 Total Prize Fund. Cheltenham, 4.40pm, Wednesday, March 14, 2012, two miles and half a furlong. For juvenile four-year olds only. Penalties: after February 26, 2012, a winner of a hurdle race 5lb. No penalty to increase a horse’s weight above 11st 10lb. Entries closed February 21 (81 entries), entries released February 23, weights revealed February 29. Six-day confirmation stage March 8 (57 remained), final declaration stage 10.00am, March 13 (24 runners). Form figures supplied by Weatherbys and are correct up and including the racing of Sunday, February 26, 2012. May not include some overseas form.